PT Astra Honda Motor (AHM) has been providing video teaser of a new product that will be launched in August. In the video, it is clear that it is a motorcycle that is registered AHM to the Ministry of Industry of the Republic of Indonesia (Ministry of Industry) on 22 June and completed status (S) on June 30. Honda motorcycle coded Y3B02R17L0 M / T is certain is that Sonic will fight in the class sports ducks against Suzuki Satria FU and Yamaha MX 150.
try to measure how about a set price Honda when the consumer wants to make this bike. Tax Agency through the Government of Jakarta, there is information that the Honda motorcycle with the code has NJKB Rp 14.9 million. So what price on the road Honda Sonic? Possibility after plus other costs, the challenger's Satria FU would be priced 30-40 percent higher than NJKB. Practically, AHM will put the price of approximately Rp 19.4 to 20.8 million. This estimate is reasonable when compared with the price of Satria FU 150 is priced starting from Rp 18.8 to 20.2 million and MX 150 Rp 18.4 to 18.9 million. Or even less? Worth the wait. 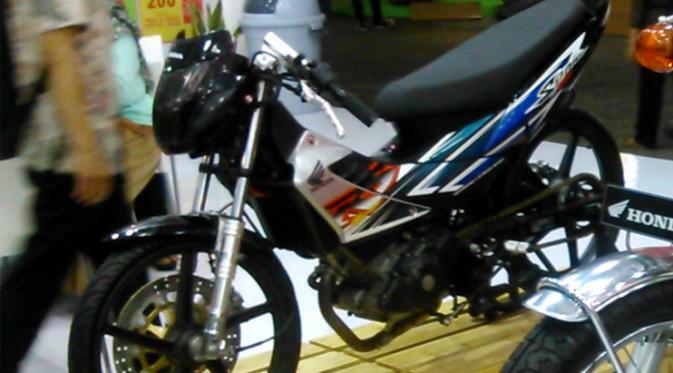 Meanwhile, Honda Sonic AHM actually been exhibited at the Jakarta Fair Kemayoran (JFK) 2015 ago. However, according to the manufacturer bearing wing flapping, this was done to test the market. "It is usual to test the market, all tough consumer response here how," replied Production Director AHM David Boediono. David continued, the strategy was indeed plural done AHM against potential models entering Indonesia. Because he said, it also made them when IMOS last year. "In the past Vultus in IMOS also we do such a strategy," he added. So how consumer response Indonesian and when Honda Sonic debut? "Kan results have not been there, yes if it do not know. For the price, it is about how the right?" said David asked.